Several years ago we purchased a baby grand piano for our living room. Although I'm not musical (trust me, I am not being modest here), my husband's family is very inclined. They can sing beautifully and play a number of instruments, including the piano. So, it was natural for us to hope that at least one of our children would be interested in learning to play. 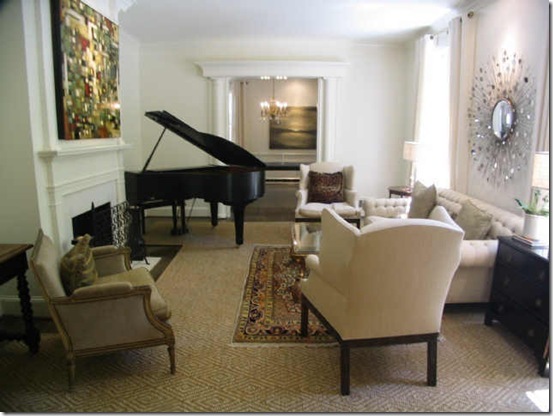 For me, the thought of getting a baby grand was sheer bliss just from a decorating standpoint. I was thrilled until . . . it arrived. It was ENORMOUS (and by baby grand standards, ours is on the smaller side). I quickly realized I was not dealing with a wall flower - they are big, bulky and the shape refuses to allow one to be placed against a wall. While I'm not a "wall hugger," (OK, I just made this term up. But, you know the type. "Wall huggers" are those who push all the furniture against the walls in their space.) I still found it difficult to make the room feel right. When you throw a huge, awkwardly shaped piano in the mix, it can truly debilitate even the most seasoned of decorators. So, I thought I would share some lessons learned on working with a baby grand. Remember: these are tips not rules and they may or may not work in your room. Consider the piano the focal point of the room. I have talked at length about the need for every room to have a focal point, and with a baby grand you have the perfect piece! 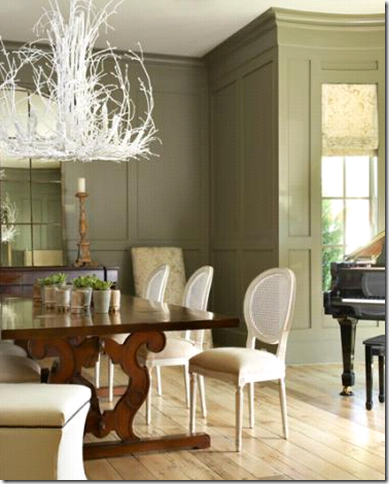 I love how the rest of the furnishings in this space are neutral which adds to the drama of the piano. Also, notice the modern moldings on the accent wall. 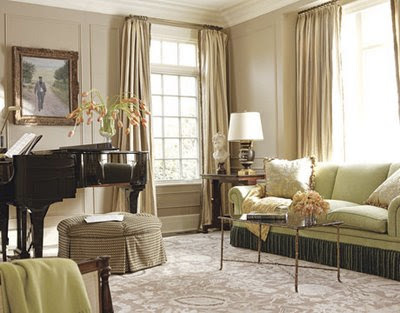 These help to frame the piano, but since they are painted out the wall color, it does not distract from the main attraction. 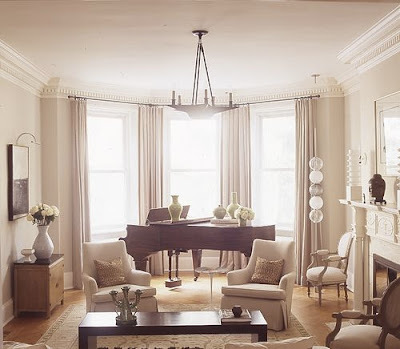 When creating the seating arrangements for the space, consider how the piano will open and arranged the seating to optimize this side of the piano (if possible). This photograph is a perfect example of this tip. 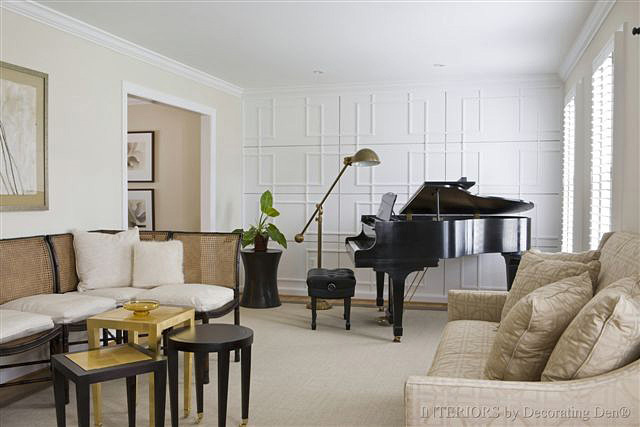 The piano lid opens to the seating area for optimal sound. 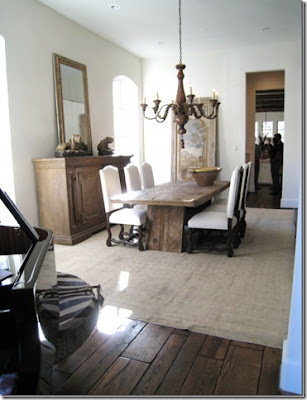 I also love the small stools for additional seating. Can't you just see a small child perch on one of these singing "My Favorite Things" as the piano is being played. 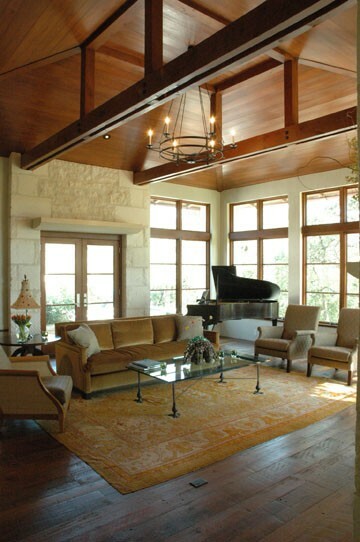 Since humidity and temperature both effect the sound of a piano, consider placing yours opposite any windows. Now, I know many of you have your baby grands in a bay window (I have even placed them there in redesigns we have completed) and it looks stunning. Just know that you will need to tune it more often if this is the case. See how the piano is pulled away from the windows. The homeowner could have easily placed it in the corner with the windows, but instead choose to create a seating area on that side of the room. Also, this is a great photo to mention that the top of the piano is a wonderful place to display accessories or flowers. 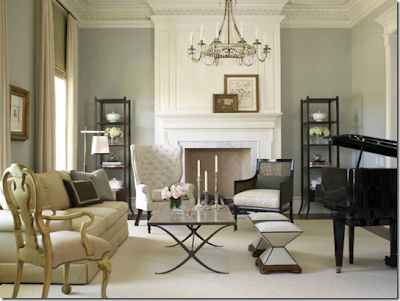 Also, notice the ottoman tucked under the curved side of the piano. Now, for the bay window exception. These are just too beautiful not to show you! I adore the hazy light of this photograph. It makes me think this picture was taken in the morning as the sun was rising. Just loving. 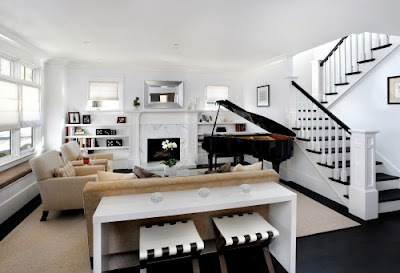 The high ceiling and placement of this piano really creates a statement in this space. 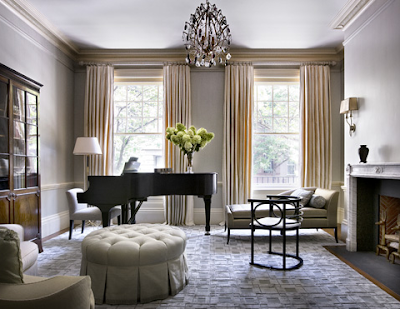 Notice the piano chair (rather than bench) in this space and the chaise for lying back, closing your eyes and enjoying the music! If I had this set up in my living room, my kids would hate me! I would make them play constantly for me. This is the perfect place for this piano. Notice the small end of the piano faces out thus allowing this small space to visually accommodate the piano. In fact this room follows all my tips for placement (away from windows with lid facing the seating area). Love it!! Notice in this image not all the tips could be accommodated. While placing it opposite the windows and rotating it so the small end is seen first, the homeowner was not able to have the lid open to the seating area. But again, these are simply tips, not rules! 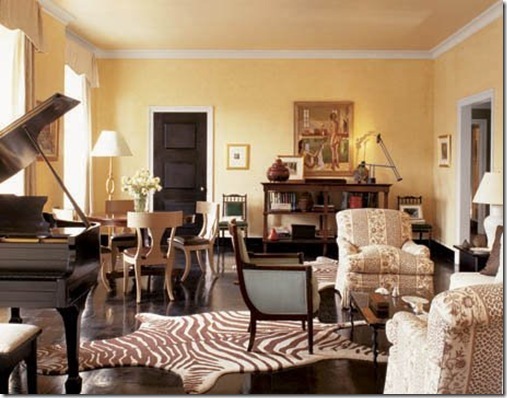 The living room is not the only room you should consider when incorporating a baby grand piano. This would really make an impression if you hired someone to play through dinner or even invited a guest to play during coffee and dessert! I am guessing this is not the formal living room based on the inclusion of the game table, but it illustrates my point that the piano does work in different rooms. what helpful hints.this is such a hard design element to work with.Your tips really help.And what fun to think of using the piano out side the living room. I just want to say your coffee table is the shiz that is all have a great day! We are thinking of getting a grand piano, and I have been worrying about how to fit one in. Will still be a problem ... but these photos are lovely and inspiring. + v helpful hints. 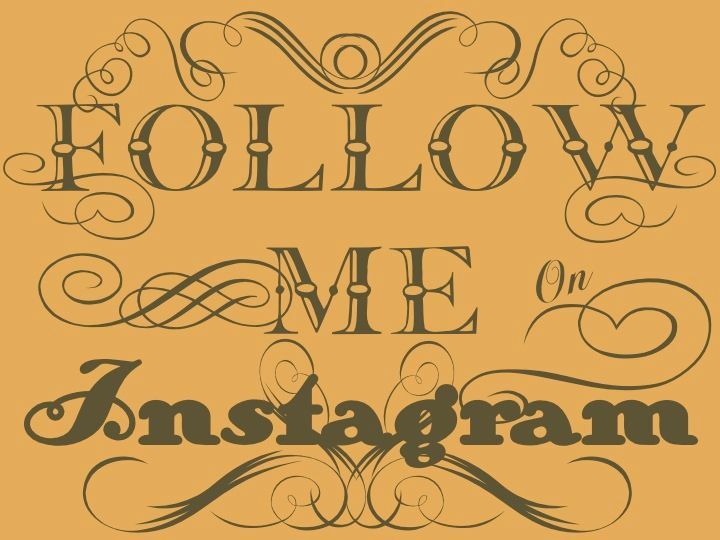 Thanks for those images. I have a client right now with a small baby grand so these will help me sell her on moving it!